At DAB Mediation Consultant, LLC we offer mediation services of the highest standards with the parties as the primary focus. Our mission is to take a Holistic approach to Conflict Resolution through Mediation while providing personalized services that Accomplish Mutually Acceptable agreements by facilitating the communication between the parties. Our professional staff combined has over 15 years experience as a mediator, arbitrator and alternative dispute resolution facilitator. We understand the need for increased awareness of alternative dispute resolution methods. Our role requires us to establish a sound infrastructure through which to support the long-term success of what’s in the best interest of the parties. Consultation - FREE 30 minute consultation. Fee - We provide a fee quote at the consultation. No hidden charges. Affordable Payment - To better assist you during this difficult time, we accept all major credit cards. 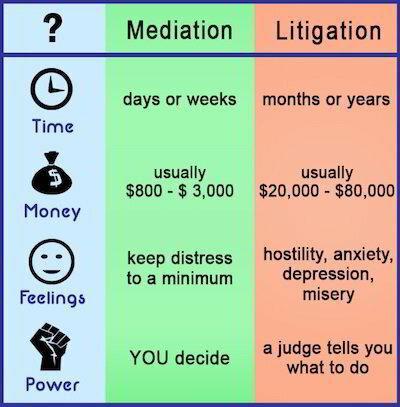 mediation process for almost less than an attorney retainer fee. personal history released to the public. On your time schedule - You decide the pace of mediation. Night and weekend appointments available. Your mediation is tailored to meet your family’s needs - You and the other parent decide your family’s future. We help you with your conflict from start to finish - We are a team of mediators working together to help you resolve your conflict on terms that are fair.